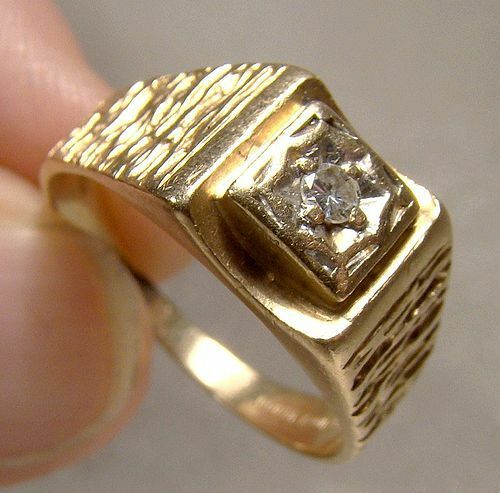 A 14k gold twin diamonds ring with two genuine round cut ~1-1/2 point diamonds circa 1970s. 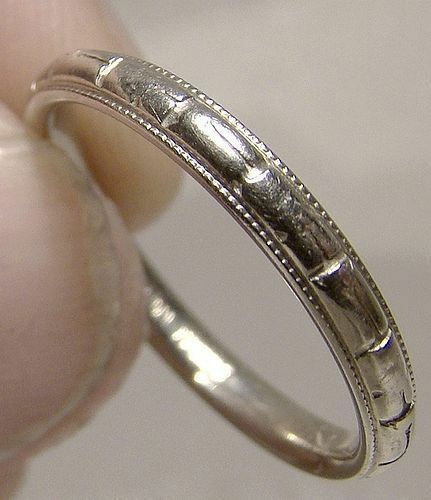 This vintage size 8-1/2 wedding band ring measures 1/4 x 3/16" across the diamond setting. It weighs 2.8 grams and it is stamped 14K. A simple classic ring of a good narrow width that can be worn as a wedding band with many engagement rings. This item is in excellent vintage condition with no chips, cracks, dents, bends, corrosion, losses, damage or repairs. All items are thoroughly and conservatively graded and all condition issues are noted; all items are vintage or antique and may have slight signs of gentle use. Expedited tracked and insured parcel shipping to the U.S. starts at $22 (other spots may vary, air is higher). Items paid with a credit card will be shipped to confirmed addresses only. We do ship internationally. All of our prices are in $US. PLEASE NOTE: We DO NOT accept PayPal. 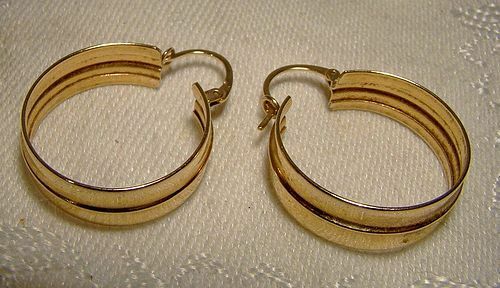 A pair of 14k yellow gold 3/4 x 7/16" pierced hoop earrings from the 1980s. These vintage earrings have hinged posts, they are stamped 585 on the posts and they weigh 1.0 grams. A great gift idea for your favourite girl or woman. They are in excellent condition with no chips, cracks, dents, bends, corrosion, losses, damage or repairs. All items are thoroughly and conservatively graded and all condition issues are noted; all items are vintage or antique and may have slight signs of gentle use. Tracked Packet shipping to the U.S. starts at $13.50 - this includes online tracking, air service and insurance up to $70. Items paid with a credit card will be shipped to confirmed addresses only. We do ship internationally. All of our prices are in $US. PLEASE NOTE: We DO NOT accept PayPal. 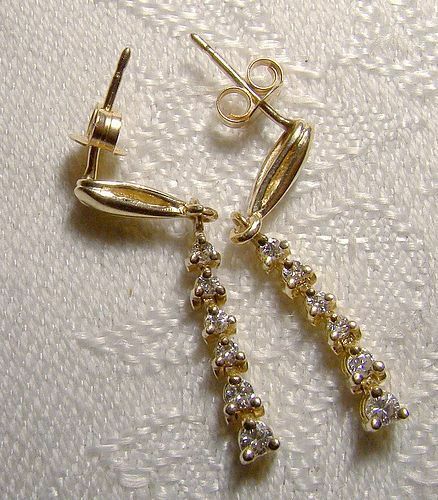 A pair of 14k yellow gold graduated diamond drop earrings with genuine diamonds circa 1970s. These vintage pierced 1-1/8" long and 1/8" wide post or stud pierced dangly earrings feature a row of free-swinging diamond fringe or sweeps and the brilliant cut diamonds are graduated and range from 2 points to 4 points by gauge (12 diamonds in all). They are stamped 14 K on the butterflies and on the posts and they weigh 2.0 grams. A great gift idea for your favourite April birthday honoree. They are in excellent condition with no chips, cracks, dents, bends, corrosion, losses, damage or repairs. All items are thoroughly and conservatively graded and all condition issues are noted; all items are vintage or antique and may have slight signs of gentle use. Expedited tracked and insured parcel shipping to the U.S. starts at $23 (other spots may vary, air is higher). Items paid with a credit card will be shipped to confirmed addresses only. We do ship internationally. All of our prices are in $US. PLEASE NOTE: We DO NOT accept PayPal. A fine sterling silver 2" tall baby mug with a gilt interior from the 1950s. 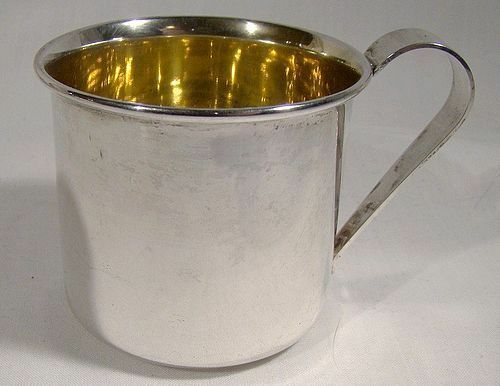 This mug is stamped STERLING WEB 520, it weighs 35.0 grams and it has never been monogrammed or inscribed. This great baby gift is in excellent condition with no dents, bends, corrosion, losses, damage or repairs. All items are thoroughly and conservatively graded and all condition issues are noted; all items are vintage or antique and may have slight signs of gentle use. Tracked Packet shipping to the U.S. starts at $14.50 - this includes online tracking, air service and insurance up to $70. Items paid with a credit card will be shipped to confirmed addresses only. We do ship internationally. All of our prices are in $US. PLEASE NOTE: We DO NOT accept PayPal. A pair of lever back pierced 3/8 x 1/4" across 10k yellow gold genuine claw-set amethyst earrings from the 1960s-1970s. They are stamped P 10K on the hoops and the amethysts measure 1.4 carats each (calculated). They weigh 1.4 grams and they are in excellent condition with no dents, bends, corrosion, losses, damage or repairs. All items are thoroughly and conservatively graded and all condition issues are noted; all items are vintage or antique and may have slight signs of gentle use. Expedited tracked and insured parcel shipping to the U.S. starts at $21 (other spots may vary, air is higher). Items paid with a credit card will be shipped to confirmed addresses only. We do ship internationally. All of our prices are in $US. PLEASE NOTE: We DO NOT accept PayPal. 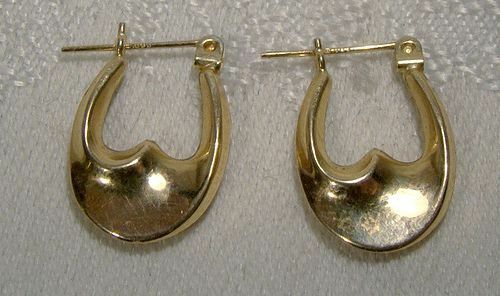 A plain, simple and elegant pair of pierced 3/4" across 10k yellow gold classic style hoop earrings from the 1980s. They are stamped BY 10K on the ear wires, they weigh 2.7 grams and they are in excellent condition with no dents, bends, corrosion, losses, damage or repairs. This item is in excellent condition with no chips, cracks, dents, bends, corrosion, losses, damage or repairs. All items are thoroughly and conservatively graded and all condition issues are noted; all items are vintage or antique and may have slight signs of gentle use. Expedited tracked and insured parcel shipping to the U.S. starts at $22 (other spots may vary, air is higher). Items paid with a credit card will be shipped to confirmed addresses only. We do ship internationally. All of our prices are in $US. PLEASE NOTE: We DO NOT accept PayPal. 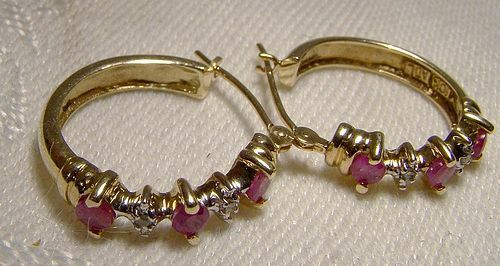 A pair of pierced 3/4" across 10k yellow gold genuine ruby and diamond hoop earrings from the 1980s. They are stamped 10K ADL on the hoops, , they have 14k posts and they feature three (~6 point by gauge) rubies separated by two diamonds on each earring. They weigh 3.4 grams and they are in excellent condition with no dents, bends, corrosion, losses, damage or repairs. This item is in excellent condition with no chips, cracks, dents, bends, corrosion, losses, damage or repairs. All items are thoroughly and conservatively graded and all condition issues are noted; all items are vintage or antique and may have slight signs of gentle use. Expedited tracked and insured parcel shipping to the U.S. starts at $23 (other spots may vary, air is higher). Items paid with a credit card will be shipped to confirmed addresses only. We do ship internationally. All of our prices are in $US. PLEASE NOTE: We DO NOT accept PayPal. 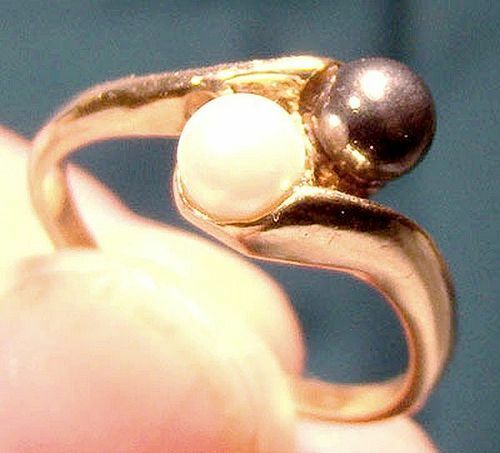 A vintage twin pearl ring from the 1960s with one cultured and one black Alaskan diamond hematite pearl in a 10k yellow gold setting. This size 7-1/2 ring features a 5 mm. cultured pearl with silver cream lustre set next to a similar sized black "pearl". This fine ring is stamped MIL 10K, it weighs 3.2 grams and it is in excellent condition with no chips, cracks, dents, bends, corrosion, losses, damage or repairs. This item is in excellent condition with no chips, cracks, dents, bends, corrosion, losses, damage or repairs. All items are thoroughly and conservatively graded and all condition issues are noted; all items are vintage or antique and may have slight signs of gentle use. Expedited tracked and insured parcel shipping to the U.S. starts at $21 (other spots may vary, air is higher). Items paid with a credit card will be shipped to confirmed addresses only. We do ship internationally. All of our prices are in $US. PLEASE NOTE: We DO NOT accept PayPal. A retro 1960s 10k yellow gold man's diamond ring. This size 9-1/2 ring features an 8 or 9 point round brilliant cut diamond (by gauge), it weighs 4.3 grams and it measures 3/8" across the setting. It is stamped 10K BRIDAL KNOT and it is in excellent vintage condition with no chips, cracks, dents, bends, corrosion, losses, damage or repairs. This item is in excellent condition with no chips, cracks, dents, bends, corrosion, losses, damage or repairs. All items are thoroughly and conservatively graded and all condition issues are noted; all items are vintage or antique and may have slight signs of gentle use. Expedited tracked and insured parcel shipping to the U.S. starts at $21 (other spots may vary, air is higher). Items paid with a credit card will be shipped to confirmed addresses only. We do ship internationally. All of our prices are in $US. PLEASE NOTE: We DO NOT accept PayPal. 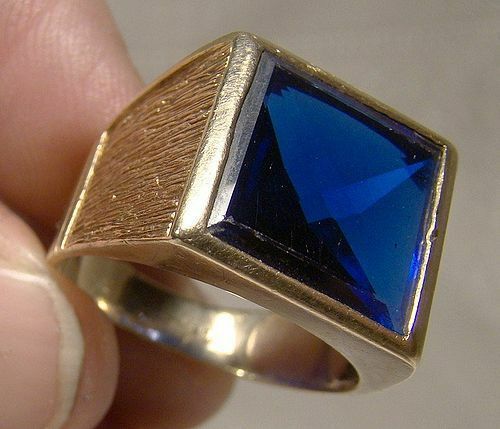 A 10k yellow gold man's synthetic blue sapphire ring from the 1950s. This vintage size 9-3/4 or 9.75 ring measures 9/16" x 5/8" along the setting. The square blue stone is bezel-set and open backed and the superb electric blue colour is always evident and shows nice light play from the rear facets (see pics). This classic modernist ring is stamped 10 K with an A+A maker's mark and it weighs a substantial 7.9 grams. Synthetic sapphires are more commonly known kn now as man made or lab created sapphires. They are made from actual colourless sapphires. The interesting effect in the stone was caused by light refraction and the band reflected in the lamp when being photographed - it is not normally present. It is in very good to excellent condition with no cracks, dents, bends, corrosion, losses, damage or repairs other than a fine patina and tiny dents from wear. All items are thoroughly and conservatively graded and all condition issues are noted; all items are vintage or antique and may have slight signs of gentle use as would be expected. Silver and silver plated items are hand-polished, not buffed, and our halogens and magnified images may exaggerate otherwise barely noticeable scratches and flaws. GUARANTEE: ALL of our items are antique or vintage and from the period listed. NONE are reproductions or recreations. Expedited insured tracked parcel shipping to the U.S. starts at $26 and expedited shipping within Canada starts at $16. Rates vary by destination, value, size, weight, payment option and shipping method. Other payment, tracking and insurance options are available - please inquire. We ship worldwide - please contact us for an accurate shipping quote with your postal code or country. **** PLEASE NOTE: We DO NOT ACCEPT PAYPAL**** © Fiona Kenny and www.fionakennyantiques.com. Unauthorized use and/or duplication of any part of this material on this site without express and written permission from this site’s author and/or shop owner is strictly prohibited. 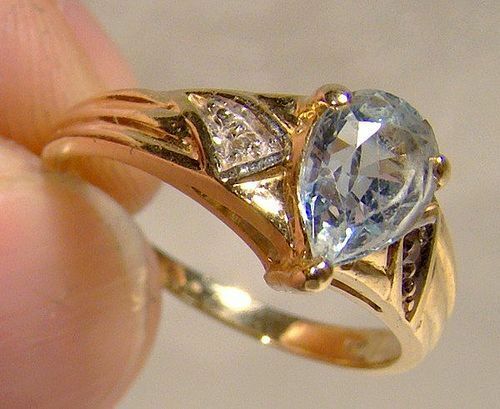 A 14k yellow gold ring featuring a teardrop cut genuine aqua blue topaz with two single point diamonds circa 1970s 1980. 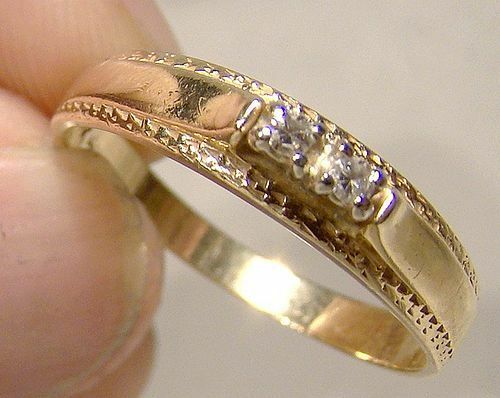 This vintage size 6-1/2 or 6.5 ring is 3/8" across the setting, it weighs 2.6 grams, and it is stamped 14K. It is in excellent condition with no chips, cracks, dents, bends, corrosion, losses, damage or repairs other than a scratch along the table of the stone (barely visible). All items are thoroughly and conservatively graded and all condition issues are noted; all items are vintage or antique and may have slight signs of gentle use. Expedited tracked and insured parcel shipping to the U.S. starts at $22 (other spots may vary, air is higher). Items paid with a credit card will be shipped to confirmed addresses only. We do ship internationally. All of our prices are in $US. PLEASE NOTE: We DO NOT accept PayPal. An Art Deco era Czechoslovakian pink intaglio crystal and pink rhinestone gilt brass pin or brooch from the 1920s. This stylish and finely detailed fashion accessory measures 1-1/2 x 1-3/8", it has three layers and the stones are all claw-set. It has the original c-clasp, it is stamped CZECHO SLOVAKIA and it is in excellent condition with no chips, cracks, dents, bends, corrosion, losses, damage or repairs. All items are thoroughly and conservatively graded and all condition issues are noted; all items are vintage or antique and may have slight signs of gentle use. All items are thoroughly and conservatively graded and all condition issues are noted; all items are vintage or antique and may have slight signs of gentle use. Tracked Packet shipping to the U.S. starts at $14.00 - this includes online tracking, air service and insurance up to $70. Items paid with a credit card will be shipped to confirmed addresses only. We do ship internationally. All of our prices are in $US. PLEASE NOTE: We DO NOT accept PayPal. A vintage sterling silver hand engraved oval 1-7/8" x 1" (including bale) photo locket on a 25" rope style chain with a springring clasp. This 1960s necklace weighs 14.4 grams, both have sterling marks and both have been rhodium plated. 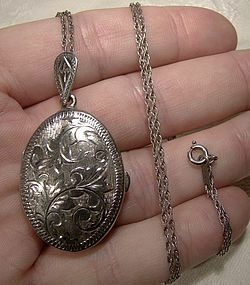 Unusually, the locket is fully engraved on both sides. 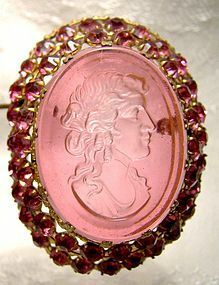 the locket has two plastic windows and bezels and wonderfully vintage garish backing cloth. This necklace is in excellent vintage condition with no dents, bends, corrosion, losses, damage or repairs. All items are thoroughly and conservatively graded and all condition issues are noted; all items are vintage or antique and may have slight signs of gentle use. Tracked Packet shipping to the U.S. starts at $13.50 - this includes online tracking, air service and insurance up to $70. Items paid with a credit card will be shipped to confirmed addresses only. We do ship internationally. All of our prices are in $US. PLEASE NOTE: We DO NOT accept PayPal. 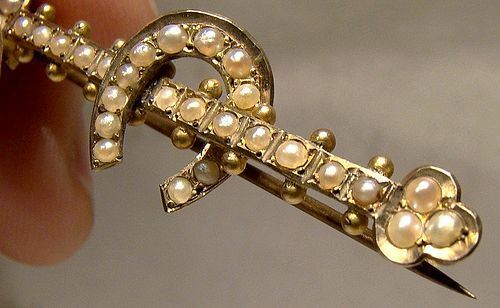 A late Victorian period gold filled lily of the valley seed pearl photo locket pendant circa 1890 1900. This hand engraved antique 1-5/16" locket is stamped P&M with other symbols and 2 10 (maker unidentified). 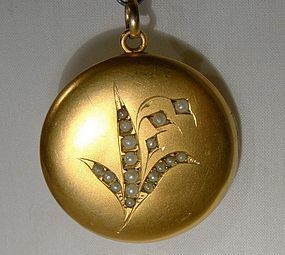 The genuine half pearls are arrayed in the form of a lily of the valley flower and this lovely matte finish locket is in excellent antique condition with only the expected slight signs of wear / patina. There are some small scratches and test acid staining from a previous test for gold content but this will be covered up by your photo. This unusual locket would make a fine gift for the love in your life. All items are thoroughly and conservatively graded and all condition issues are noted; all items are vintage or antique and may have slight signs of gentle use. Expedited tracked and insured parcel shipping to the U.S. starts at $23 (other spots may vary, air is higher). Items paid with a credit card will be shipped to confirmed addresses only. We do ship internationally. All of our prices are in $US. PLEASE NOTE: We DO NOT accept PayPal. A nicely made open heart shaped 10k white gold and diamonds pendant necklace circa 1970s. 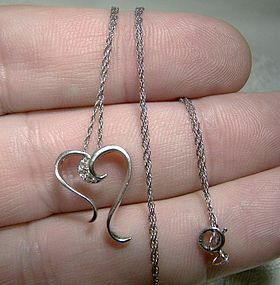 The heart pendant measures 3/4 x 1/2", it has three single point diamonds and this necklace weighs 1.6 grams. The white gold chain is very fine and both the pendant and chain are stamped 10K. Great something old bride necklace or a valentine or birthday gift. All items are thoroughly and conservatively graded and all condition issues are noted; all items are vintage or antique and may have slight signs of gentle use. Expedited tracked and insured parcel shipping to the U.S. starts at $20 (other spots may vary, air is higher). Items paid with a credit card will be shipped to confirmed addresses only. We do ship internationally. All of our prices are in $US. PLEASE NOTE: We DO NOT accept PayPal. 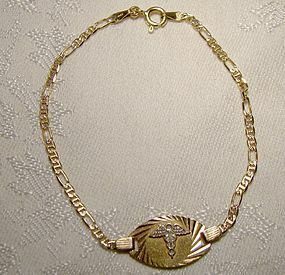 A vintage 7-3/8" long 10k yellow gold Medic Alert bracelet c1980. This bracelet has a 3/4" x 1/2" central textured finish planchette with a mounted white gold caduceus / Medic Alert symbol, and it has a springring clasp. The back has been shallowly engraved but it can be removed to allow your own medical cautions and allergies to be engraved. It is stamped 10K and 10KT, and it weighs 3.2 grams and it is in very good vintage condition with no dents, bends, corrosion, losses, damage or repairs. All items are thoroughly and conservatively graded and all condition issues are noted; all items are vintage or antique and may have slight signs of gentle use. Expedited tracked and insured parcel shipping to the U.S. starts at $23 (other spots may vary, air is higher). Items paid with a credit card will be shipped to confirmed addresses only. We do ship internationally. All of our prices are in $US. PLEASE NOTE: We DO NOT accept PayPal.